Using advanced technology to give you new teeth and a brighter smile. All services provided in one office, from start to finish! Dr. Ressler is a U Penn/NYU-trained surgical specialist with over twenty years of experience placing dental implants. Crowns, gum treatment, and implants- all performed in one place! We replace missing or broken teeth, help secure loose-fitting dentures, and use the latest cosmetic dentistry techniques to deliver natural, life-changing smiles for our patients. Why patients travel from all over South Florida to see Dr. Ressler for their dental implants and cosmetic dentistry. 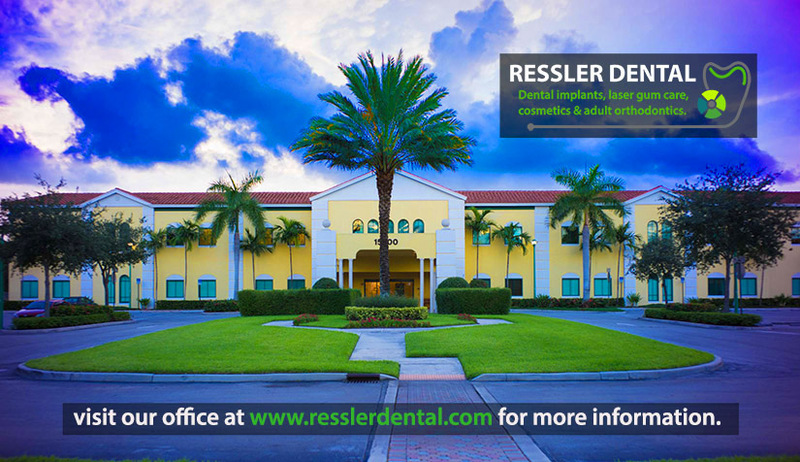 Dr. Ressler received his dental degree from the University of Pennsylvania (D.M.D.) and three years of training in dental implant surgery at New York University during his residency as a periodontal specialist. Dr. Ressler has well over twenty years of experience placing many thousands of dental implants and performing a wide range of dental and oral surgery procedures. 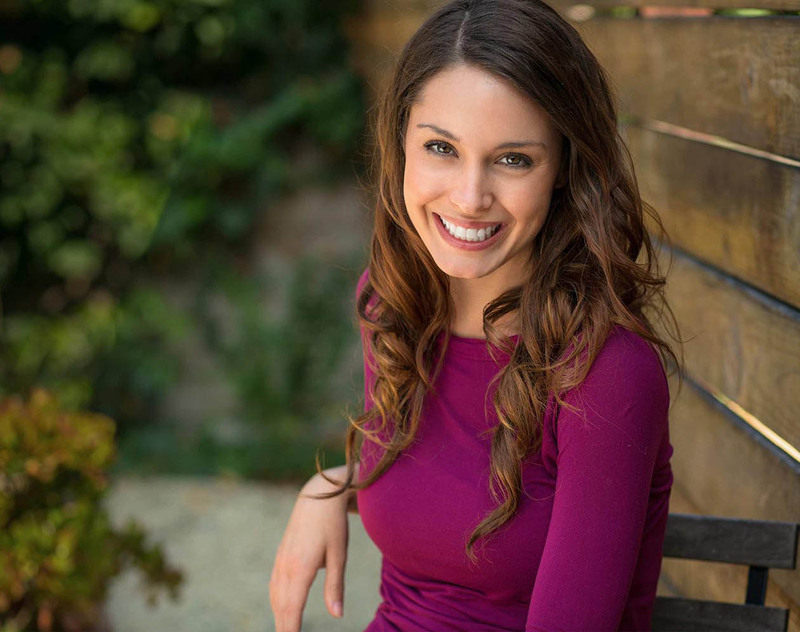 Dr. Ressler has been trained in both the surgical placement of dental implants as well as the restorative phase of implant treatment in which the actual teeth are fabricated and fitted. In other words, both the dental implant surgery to place implants in bone and the dental work that follows after healing are all performed under one roof for convenience and simplicity, instead of requiring travel to more than one office for dental implant care. Dr. Ressler’s goal is to deliver the best cosmetic dentistry possible, using modern, high-strength ceramics for the most natural color and appearance of the final result. Smile with confidence! Dental implants are a long-lasting solution that can help you to enjoy your favorite foods again, end the embarassment of missing teeth, look younger, and help you live the kind of life you deserve. Dental implants are small titanium or zirconia cylinders that serve as replacements for the root portion of a missing natural tooth. Dental implants can be placed in either the upper or lower jaws. 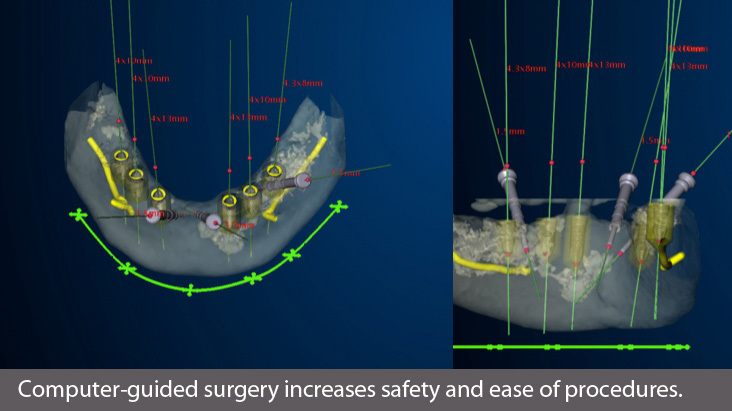 Due to the biocompatible properties of the implant material, a dental implant fuses with the bone and becomes a excellent anchor to support replacement teth. Dental implants can be used to replace single teeth, multiple teeth, or even to secure loose-fitting dentures. With over a million patients treated and more than three decades of clinical data, statistics confirm an proven success rate for individual Nobel Biocare and Straumann dental implants and the replacement teeth they support. How does a dental implant work to replace a tooth? 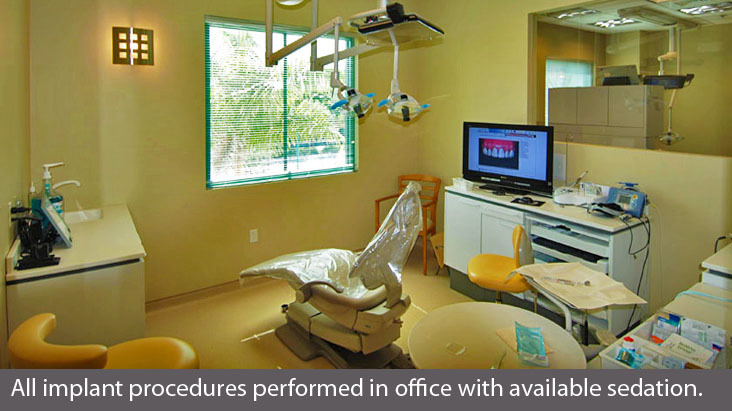 State-of-the-art dental implant care by an NYU-trained surgical specialist. Choosing an implant dentist is an important decision for you. 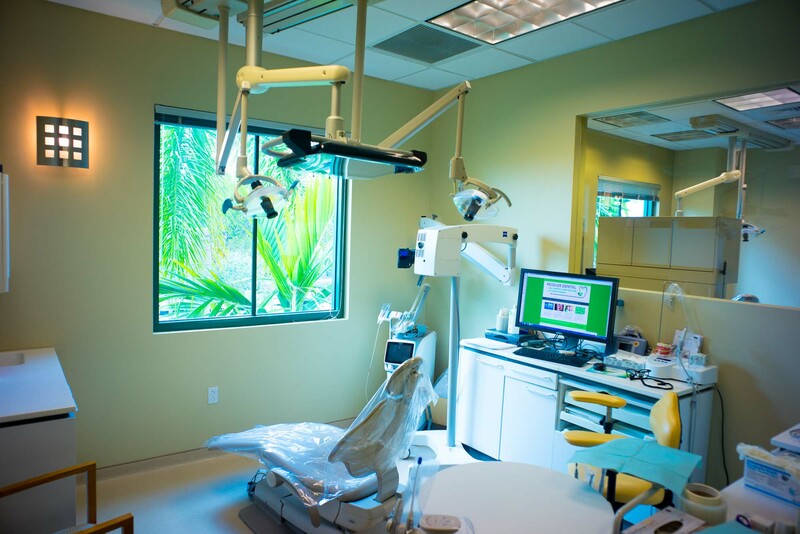 In addition to 20 years of experience in the dental implant field, Dr. Ressler has established one of the most technologically advanced dental offices in the Boca Raton and Delray Beach area. 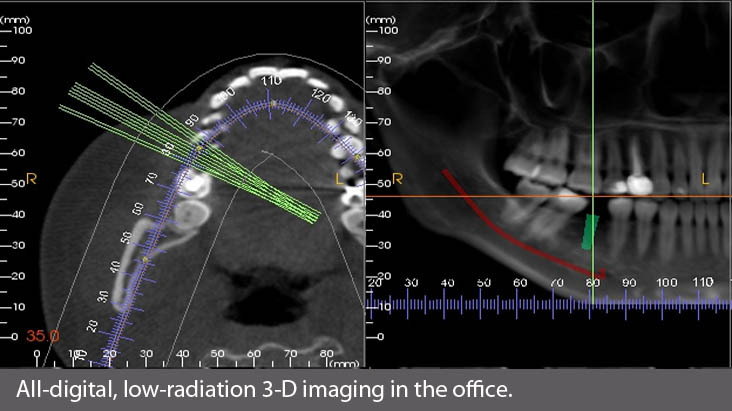 His office is equipped with a 3-dimensional, low-radiation CT scanner to help plan and place your dental implants safely and efficiently. 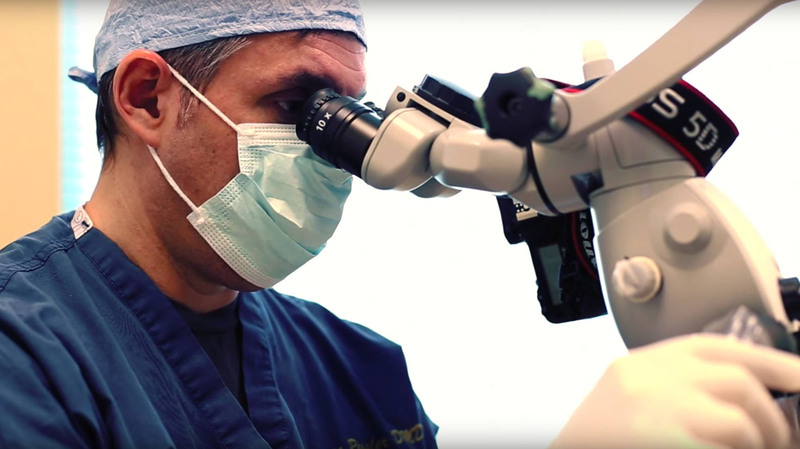 Dr. Ressler is also one of the few doctors in the area to incorporate an operating microscope for dental procedures, use an advanced laser system for treatment of gum disease, and use piezo technology as modern alternative to the dental drill. Replace missing or broken teeth. Feels like your own teeth. Enjoy your favorite foods again. How do dental implants replace more than one tooth? 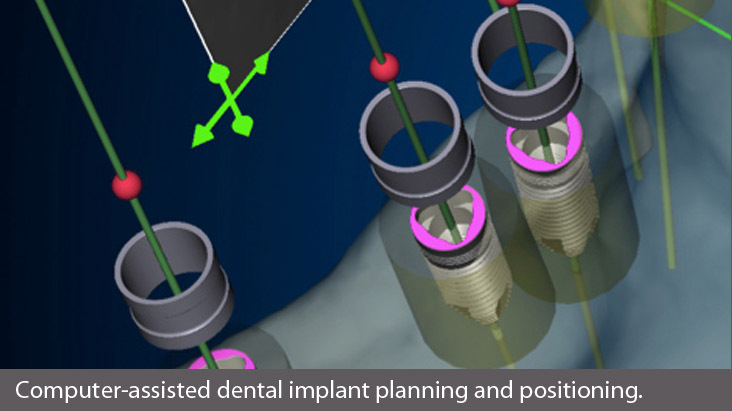 Implants can be used together to support a dental implant bridge. Solutions for a wobbly denture are literally a snap!! 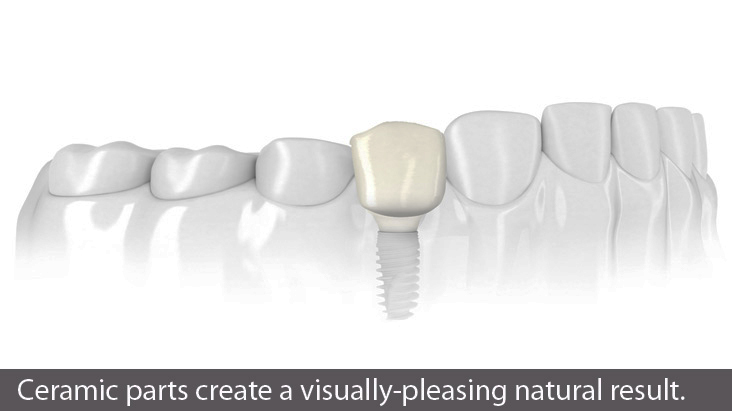 Dental implants are small titanium screws that serve as replacements for the root portion of a missing natural tooth. Dental implants can be placed in either the upper or lower jaws. Due to the biocompatible properties of titanium, a dental implant fuses with the bone and becomes a good anchor for the replacement tooth. Dental implants can be used in solutions for replacing single or multiple missing teeth, or even to secure loose fitting dentures. Locator attachments fit on anywhere from 2 to 4 dental implants to allow your existing denture to literally “snap on” into place. No more embarassments with a loose-fitting denture – visit your favorite restaurants and speak, laugh, and eat with the confidence that you deserve! Implant supported denture snap-ons allow you to have a denture that locks into place, that can only be removed when you want to remove it! Expert dental implant care is only a phone call away. Schedule an appointment today to talk to Dr. Ressler to find out how dental implants can restore your confidence, replace missing teeth, or stabilize loose-fitting dentures. Our friendly staff will help make your first visit to our office an absolute pleasure. 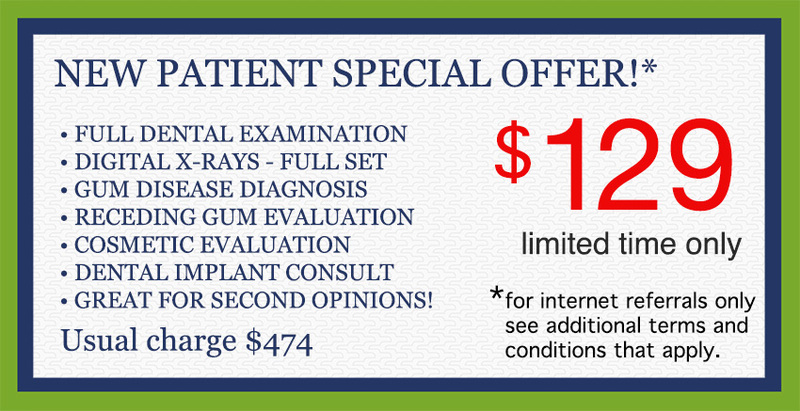 Call us today at 561.499.7400 and ask us about our special new patient introductory offer! Patients today have more options than ever to replace missing and broken teeth without resorting to removable dentures. Tooth implants or dental implants have been available for many years and are a safe, reliable, and effective way of replacing missing teeth. Dental implants can be used invididually to replace a single missing or broken tooth. They can also be used in pairs or in larger numbers to replace multiple teeth, or secure loose-fitting dentures to prevent them from floating, rocking, or coming loose during eating, chewing, or talking. Millions of dental implants have been placed arond the world, and the best way to learn if you are a candidate for dental implants is to consult with a dental surgical specialist. Dr. Ressler can give you a personal evaluation, and help determine the best treatment approach for you. What to expect during a dental implant procedure. Dental implant placement is often a very simple procedure, performed in the dental officewith a simple local anesthetic. A small incision is made in the gum tissue, and a small space is gently prepared in the jaw bone to accomodate the titanium dental implant cylinder. There is really very little discomfort during the procedure. A small number of soft or resorbable sutures (stiches) are placed. Very little post-operative discomfort is to be expected, and most patients need only take an over-the-counter analgesic (Tylenol, Aleve, Motrin, ibuprofen) for a day or two following the procedure. All-on-4 dental implants (or All-on-6) is a treatment method offered at RESSLER DENTAL (using Nobel Biocare® implants) that delivers a complete dental implant solution for patients with multiple missing or highly compromised teeth, often within a single day. 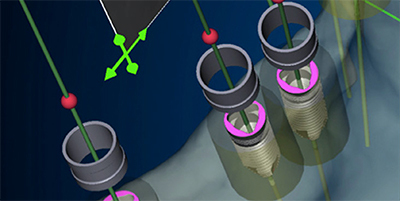 Four or more dental implants are placed in strategic positions that often eliminate the need for complicated bone grafting or sinus elevation procedures and reduce the extended treatment times that come with traditional dental implant techniques. ALL-ON-4 dental implants are a fixed, permanent dental implant solution with a very natural appearance. 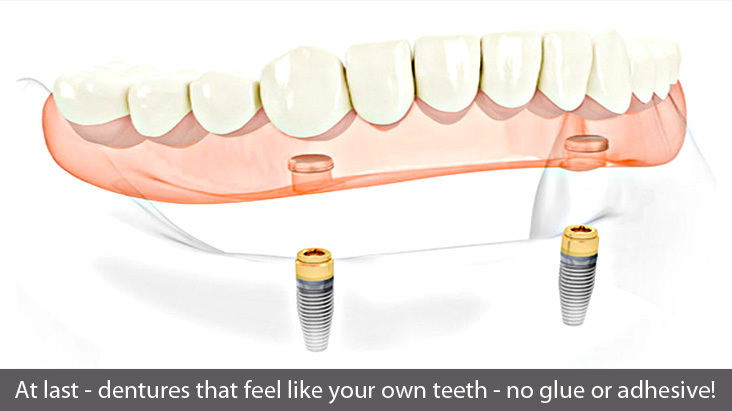 With ALL-ON-4 dental implants, you will no longer need to feel embarrassed by your teeth. Start enjoying your favorite foods again, and regain confidence and self-esteem with the healthy and beautiful smile that you deserve. What are Teeth Today® dental implants? Teeth Today® is a treatment method offered at RESSLER DENTAL (using Straumann® implants) provides the long-term benefits of dental implants without the hassle of multiple dental visits and extended treatment times. Replace multiple failing teeth in a single day, not just with functional teeth that will allow you to enjoy your favorite foods again, but with a gorgeous smile that your friends and family will definitely notice! Learn more about this revolutionary method of replacing teeth with dental implants below, and schedule a convenient appointment to meet Dr. Ressler and find out if Teeth Today® is right for you! Can dental implants help me if most of my teeth are failing? Dr. Ressler offers the latest technologies that can provide a solution for you. Dr. Ressler is a surgically-trained dentist and a recognized expert in the field of dental implants. Dental implant treatment is surprisingly comfortable and usually takes less than an hour, performed in the office with local anesthetic. 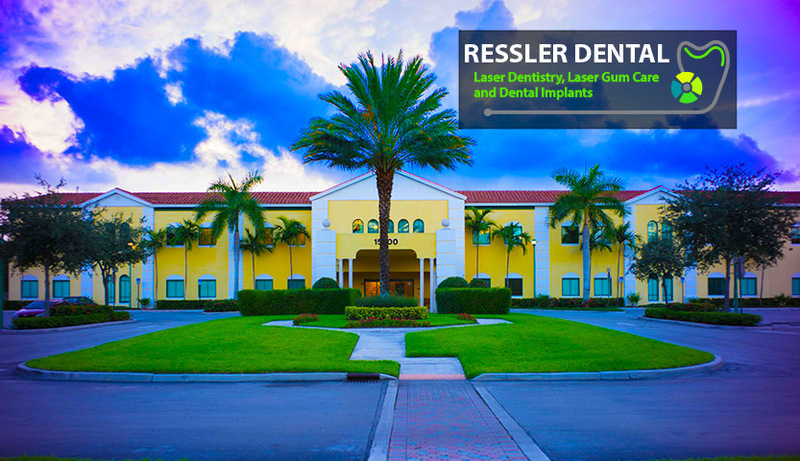 Dr. Ressler has placed thousands of dental implants and helps people all over South Florida re-build their smiles. Easy access for cleaning and flossing. Replaces teeth lost to gum disease. Difficult to clean or floss underneath. Requires grinding down of adjacent teeth. Poor choice for patients with gum disease. Prone to future decay and tooth loss. Little cost savings if any. Average life of 5-10 years (ideal conditions). Dr. Ressler strives to provide you with the best possible dental treatment by performing thorough examinations to help plan your care especially for you. He will take the time to talk with you, discuss your specific needs, and present all of your options (there are usually quite a few) so you can make an informed choice. It is therefore difficult, if not impossible, to fairly estimate the cost of dental implant treatment without first examining and evaluating you. The simplest dental implant cases, however, can be financed through a convenient payment plan starting at $62/month for qualified patients. You can read more about what goes into determining the cost of dental implants below. Patients visiting Dr. Ressler for a dental implant consultation receive a very thorough evaluation and a review of their medical history. Patients usually bring a complete set of dental x-rays (18 films) taken within the last year to the office or have digital x-rays sent electronically to our office e-mail account. Arrangements can be made for taking dental x-rays in our office if recent ones are not available, or if the current x-rays are not sufficient. A complete dental and periodontal examination is performed and the x-rays are reviewed by Dr. Ressler. 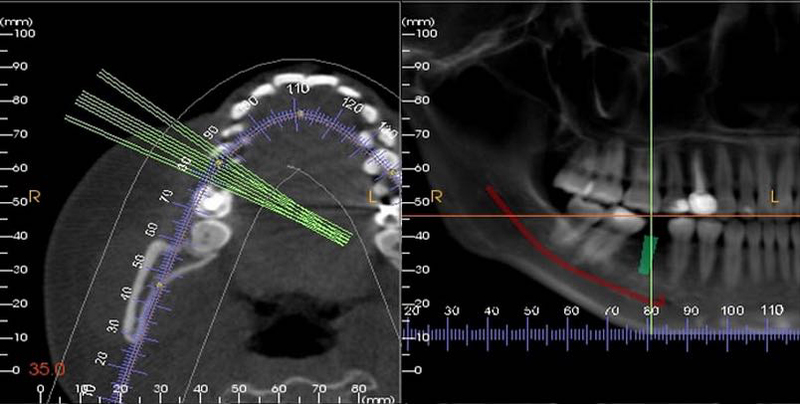 Sometimes it will be necessary to complete a 3-dimensional scan of the jaws to determine the quantity and quality of bone available for implants. Dr. Ressler will discuss your concerns with you, review all of your available options, and answer any questions that you or a family member may have. Occasionally, a second visit will be necessary to gather more information, and to further discuss your case. Projected costs and the time-frame to complete your dental treatment will be discussed, and an appointment can be made for you when you are ready to begin. 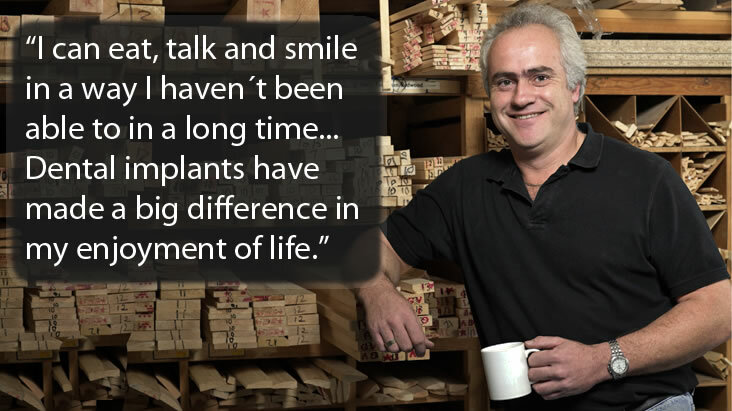 "Dental implants have to be one of the most satisfying services I offer my patients. I do everything possible to save my patients' teeth, but when that just isn't possible, they get a second chance with dental implants - it really can be life-changing for them . . . and they are happy that they are being taken care of by a dentist with formal surgical training." Implant dentist / periodontist - state-of-the-art care. A recognized and experienced clinician, Lawrence L. Ressler, D.M.D. received his dental training from the University of Pennsylvania (PENN) and his specialty certification in periodontics and dental implant surgery from New York University (NYU). 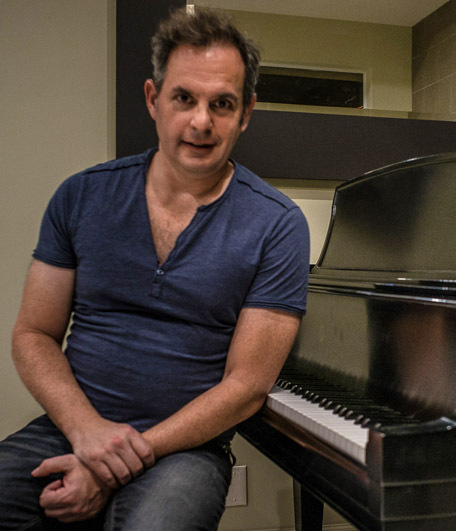 Dr. Ressler also holds two undergraduate degrees from Tulane University (B.A.) and the F.I.U. College of Engineering (B.S.). Dr. Ressler listens to you, and uses his expertise to determine how he can best help you. He offers reasonable options and alternatives for dental care, and saves teeth whenever possible. Our office incorporates the latest and most proven technologies to make the dental experience easier - and more comfortable for you. We treat all of our patients like members of our own family. 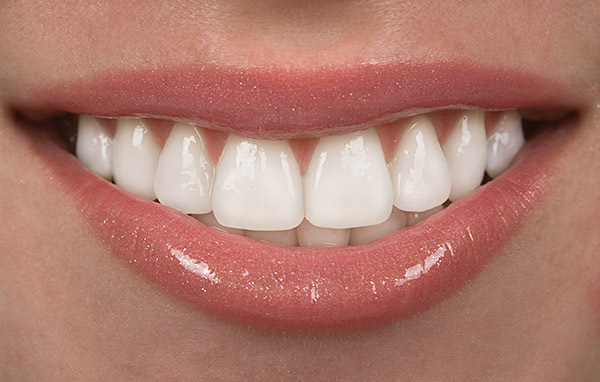 Beautiful, great-fitting ceramic crowns while you wait- no temporaries, no goopy impressions! 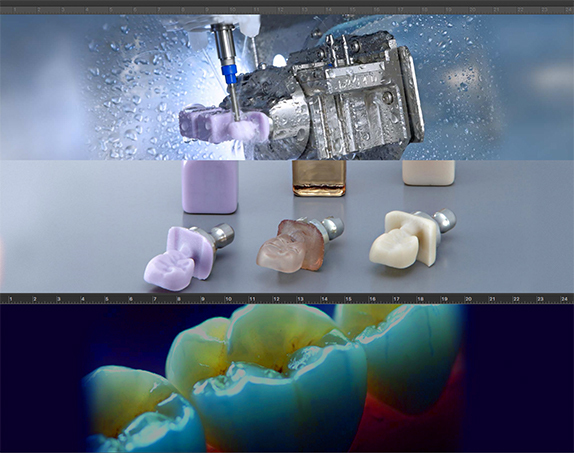 Creating a beautiful smile requires planning, artistry, and design. Call our office today at 561.499.7400 and a friendly member of our office staff will be pleased to answer any questions you may have about our practice or your particular dental needs! Be sure to ask us about our current SPECIAL OFFERS and INTERNET PROMOTIONS when you call our office! We help to make dental treatment affordable!